Icebox cakes top the list of simple, delicious desserts that can feed a crowd. With strawberry season upon us and these bright, juicy berries abundantly available, there’s no better time to make a strawberry icebox cheesecake for your next potluck or get-together. 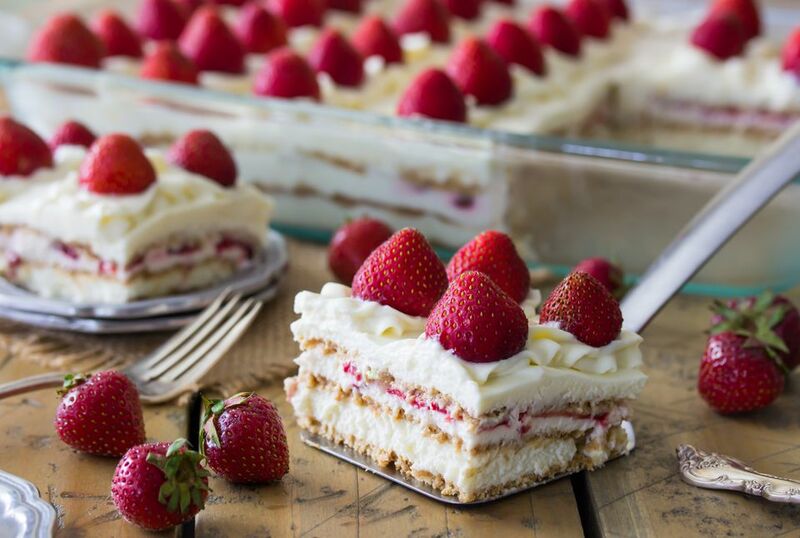 Strawberry icebox cheesecake can be assembled in advance in under 20 minutes, making for a perfect fast, easy dessert that’s sure to impress your guests. This icebox cheesecake has all of the same rich, creamy taste of standard cheesecake, lightened up with whipping cream and layered with graham crackers in lieu of a crumbly crust. It looks intricate with its many layers, and no one will guess that this icebox cheesecake was assembled in a matter of minutes. One of the best things about this strawberry icebox cheesecake (aside from how easy it is to make) is how completely customizable it can be! Play around using different varieties of graham crackers, or use your favorite seasonal fruit to make your dream icebox cheesecake! Rinse, hull and pat-dry your strawberries. Reserve whole berries for the top of your cake (about 16 small berries or 8 large berries) and slice the remainder. Using a stand mixer, or a large bowl with an electric hand mixer, stir cream cheese until smooth. Gradually stir in about half of the heavy cream. Stir until smooth, pausing once to scrape down the sides of the bowl. With a mixer on medium-low speed, gradually add the remaining heavy cream. Increase speed to medium-high and beat until mixture begins to thicken (about one minute). Pause to scrape the sides and bottom of the bowl, and add powdered sugar and vanilla. Stir again, gradually increasing speed to high. Beat until thick, fluffy whipped cream texture is achieved. Cover the bottom of a 9x13 pan with an even layer of graham crackers (about 9 sheets — break graham crackers as needed to best fit). Spread about 1/3 of the cheesecake mixture evenly over the graham crackers. Place another layer of graham crackers over the cheesecake layer, evenly spacing as needed and gently nestle them into the first layer. Spread half of the remaining cheesecake over the graham crackers. Top with sliced strawberries, distributing strawberries evenly over cheesecake layer. Evenly space another layer of graham crackers over the strawberries, using the graham crackers to press the strawberries snuggly into the cheesecake layer. Top graham crackers with remaining cheesecake mixture and spread evenly. Top with remaining strawberries (if your strawberries are quite large, halve or quarter them before topping strawberry icebox cheesecake). Cover and refrigerate at least 4 hours before serving. This will soften the graham crackers and give them a cake-like texture.